Dana Schutz’s new show at Petzel opens on a woman painting in an earthquake. Her sneakered foot rests on a skull. I think of Schutz having to work after the earthquake of the last Whitney Biennial, debris flying at her that she never expected, yet managing in spite of the --in my opinion--wholly undeserved misplaced vitriol about her painting of Emmett Till, to carry on with her work and her life. 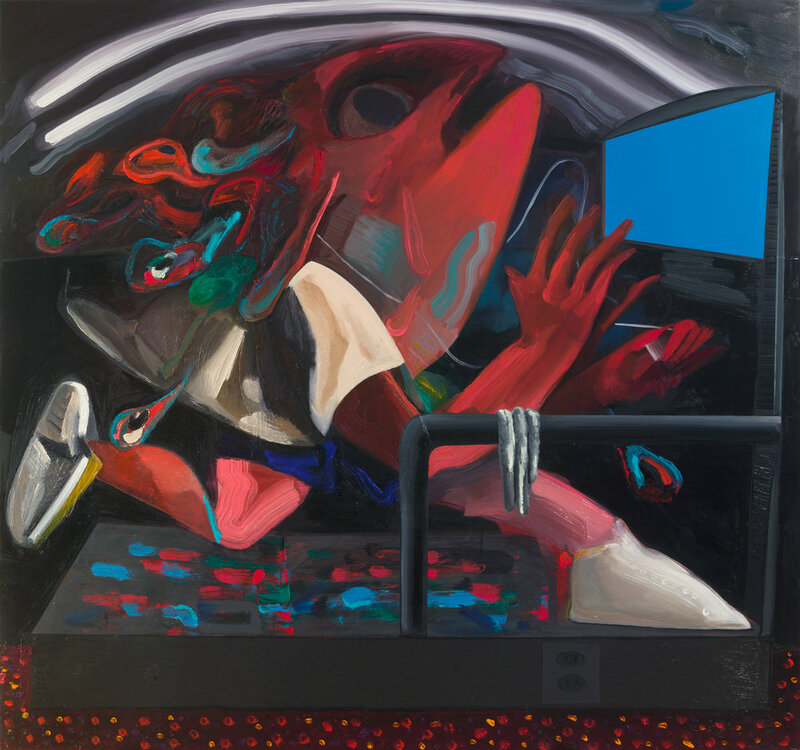 Another painting in this collection shows a woman on a treadmill watching a blank screen. Maybe this was the only way to exorcise that troubling time. We are told as readers never to conflate the work with the writer. And yet it’s impossible not to conjure up the life surrounding this new work, at odds with a self-effacing, private self. Instead it is filled with monsters and demons, bold slashes of color, trouble, wandering, marching and strangers as well as the occasional more pastoral: the sun, a boatman, a mountain group. My favorite image, having spent the previous evening with Manet’s Odalisque is Schutz’s equally provocative version, a green eyed woman who boldly confronts the viewer, refusing to sink beneath the waves, a pelican with a raspberry standing in for Laure and her bouquet of flowers. Shutz imparts more emotion into a finger or a limb than most artists can into a face. Each element of a body is articulated. It reminds me of flamenco dancing—sometimes your head is going one way, your hands another, your body yet another. Your feet are stamping to get attention. Yet somehow the whole makes sense if you add enough emotion. Emotion is the overlay to Schutz’s more formally excellent qualities. I feel a gut punch at every image. 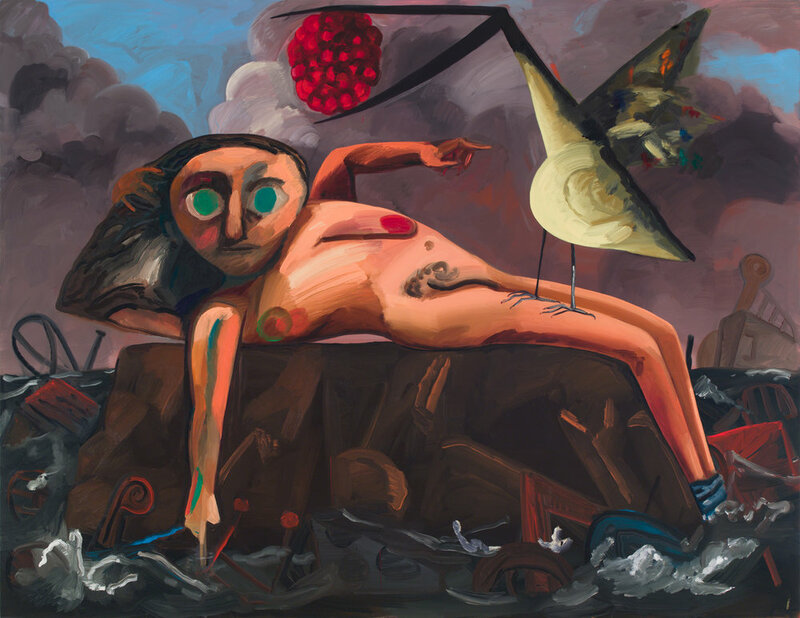 There is still plenty of Philip Guston in Schutz and even Picasso, but that’s all to the good. Schutz is not afraid to reference her heroes and heroines, to give credit where it’s due. Her bronze sculpture is new and engaging, her painting impasto translating readily into the dynamic, often humorous creatures as if Giacometti had run riot. I am obviously a fan of Schutz’s bold and ambitious work. I believe she is one of our leading, most authentic artists. Dana Schutz, Imagine Me and You, Petzel Gallery, 18th Street, open until February 23.